Hailing form a family of musicians, S. MAHATHI is a child prodigy. Her father Sri. Thiruvaiyar P. Sekar, a Vocalist is a disciple of Padmavibhushan Dr. M. Balamurali Krishna. Her mother Smt. Vasanthi Sekar is a Flautist, is the grand disciple of Sri. T. R. Mahalingam, Sri. N. Ramani and Smt. Kesi. She is the great granddaughter of the famous violinist “Sangeetha Kalanidhi” Pazhamaneri Swaminatha Iyer. Mahathi, started identifying Classical Ragas at the tender age of 1 ½ years. This talent was identified by the parents during her father’s concert at a temple in Palakad. Her parents nurtured her talent by teaching her more and more Ragas. When she was 2 ½ years old she was able to identify about 75 Carnatic Ragas. In those days, just to test her talents, her father used to mix up Carnatic Swaras but Mahathi did not hesitate to identify the exact swaras of the Ragas. When she was 3 yrs old she came to Chennai with her mother for the December Music season (1988). At the Concert of Mandolin U. Srinivas at the Mylapore Fine Arts, on December 25th Mahathi, sitting on her mother’s lap kept identifying the Ragas played by the musicians on stage. The Secretary of the Sabha, who was sitting next to her mother arranged for a live demonstration of the child’s talents, soon after the main item of the concert got over. Mahathi, without the slightest hesitation identified all the Ragas and enthralled the audience. This incident appeared in all the leading news papers at that time. Mahathi underwent her initial musical training from her parents and from Deepa, Gayatri of Trivandrum. When Mahathi’s family moved to Trichur, she was put under the guidance of Sri. Mangad K. Natesan. She has been awarded the scholarship for Classical Music from the Central Government of India in the year 1994. At Trichur she began to sing in various Devotional Cassettes. She sang for some of the Malayalam movies. Completing her 10th Standard, her family moved to Cochin, where she did her 11th in Sacred Heart Convent. At this juncture, once during her visit to Chennai, she had the greatest opportunity of meeting Isai Gnani Illayaraja. The Isai Gnani, recognizing her musical talents, made her sing a Solo “Enna Maranthalum” in his music direction in the movie “Kaadhal Jaathi”. 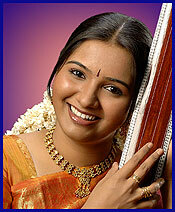 Meanwhile, in 2001, Mahathi bagged the prestigious Kerala State Award for Classical Music in the Youth Festivals. She also got the title “Bala Bhaskara” form the VDS Arts Academy, Chennai. Completing her 11th Standard, her family moved to Chennai, foreseeing her career in the Playback Singing field too. The year 2003, was a turning point in Mahathi’s life. On May 1st 2003, came her smash hit “Aiyyaiyyo Pudichirukku”, a duet song with Sri. Hariharan, Music Directed by Sri. Harris Jeyaraj in Vikram’s Super Hit Movie “Saamy”. Her recent hits are Eppadiyum Oruthankitta – Nee venum da chellam, Innisai Alabedayey – Godfather, Yammadi Athadi – Vallavan. Some of the other movies to be released shortly are Thoovanam. Mudhal Kanavey, Piragu, Payyanum ponnum, Achacho, Pudhusa irukku, Paali etc. In the Carnatic Music field, she has been performing in Various Sabhas during the December Music Festival. She undergoes musical training from Padmabhushan Sri. T. N. Seshagopalan. In the year 2003 she had the blessing of performing before her Guru. Sri. T. N. S., on December 25th Parthasarathy Swamy Sabha, Chennai. She has recently been awarded the Direct B High Grade in the All India Radio. Her parents are running a Musical School by name Mahathi Academy of Music and Dance at No.23, Munusamy Street, Venkatesh Nagar, Virugambakkam, Chennai – 600 092 teaching Vocal, Veena, Violing, Flute, Mirudhangam, Guitar, Key Board and Bharathanatyam to promote young talents. Mahathi has sung for a lot of Commercial Ads like Pothys, Chennai Silks, RMKV and Tele Serials like Sahana, Priyamudan KB, Rekkai Kattiya Manasu, etc… She is also the anchor of a musical show “Aha Paadalam” in Doordarshan Pothigai. Recently she had the opportunity of performing with Sri. S.P. Balasubramanyam and S. Janaki and other Play Back singers for Kaviperarasu Sri. Vairamuthu’s function “Kavithayey Paadalaaga” in the presence of our Hourable Chief Minister of Tamilnadu Kalaignar Karunanidhi. She had the opportunity of performing for Dr. M. Bala Murali Krishna’s 75th Birthday Celebrations at The Music Academy in the presence of Selvi. J. JayaLalitha. She was invited by Maestro Illaiyaraja to anchor the show “Andrum Indrum Endrum Maestro” A live – in concert at the Indoor Stadium Chennai and her performance on that day was well appreciated by all. Mahathi’s performance at the Sri Parthasarathy Swamy Sabha on 21/12/2005 has been adjudged as the Best Performance of the December Season 2005 and she has been awarded the Best Performer Award for 2005. +All Kerala ICSE award for Light Music in 1996. +All Kerala State First award for Carnatic Music in 2001. +Bala Bhaskara award in 2001, for Excellence in Carnatic Music. +Sensational Debut Singer award from Variety film awards 2003 for Saamy. +Best Singer Award form Ajantha Arts Academy for Saamy. +Best Debut Singer Award form M.G.R. – Sivaji Arts Academy for Saamy. +Toured all over Malaysia and Singapore for Classical Concerts in 2002. +Toured Burma (Myanmar) for Star Night Shows with Sri. Gangai Amaran and Sri. Malaysia Vasudevan in 2002. +Performed at Colombo, for Boy’s Boom Boom night with Singers Vasundara Das, Manikka Vinayagam, Tippu, Karthik, Malathi Lakshman etc. Recently toured London, Colombo, Kandy for Light Music and Classical Concerts. Recently toured Germany, Sweden, Norway and Denmark for concerts and shows. Toured Australia (Melbourne & Sydney) with Dr. K. J. Yesudas & Smt. Sujatha in Oct 2006. Performed at the Opera House Concert Hall Sydney. This Perfromance is the First Tamil Show at the Opera House.